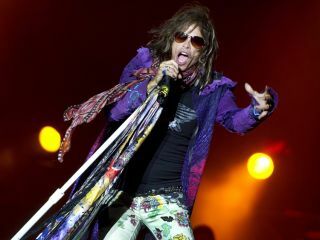 Steven Tyler on-stage with Aerosmith in 2010. Aerosmith and American Idol's Steven Tyler has told Howard Stern that he gave up the chance to fill Robert Plant's shoes and become the singer in a reformed Led Zeppelin. When MusicRadar spoke to Jason Bonham, who played drums for Led Zeppelin at their 2007 reunion gig, he intimated that a singer other than Myles Kennedy, who had been linked with the band, had almost joined them for a tour in 2008. Robert Plant, of course, had decided that he didn't want to go on the road again as part of Led Zep. It now seems that this singer may have been Tyler; he told Stern this week: "I spoke to Jimmy Page's manager, Peter Mensch, who's been a good friend of mine forever. He said Robert wouldn't play with them again, and would I want to come over and jam with the guys? I went over and played." By the end of the audition - if that's what it was - Tyler claims that Jimmy Page made him an offer: "It came time for him to say, 'You want to write a record with me?' I went, 'No.' I'm in Aerosmith. He's in the biggest band in the world and I'm in a band like that. I have such an allegiance to my band and I love it so much." Despite that allegiance, it seems that a full-on Aerosmith reunion may be some way off, too, with Tyler telling Stern that he hasn't spoken to guitarist Joe Perry "in a long time". Maybe Jimmy Page would be interested in filling in for him?